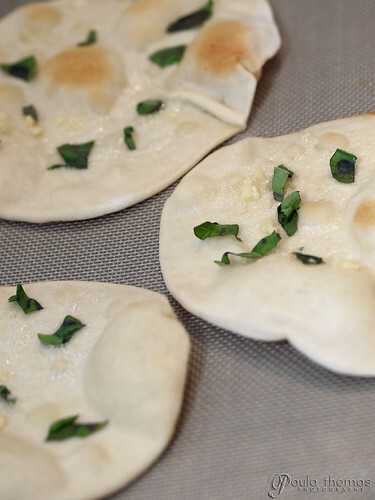 This week is "N" in my Food: A-Z project so I decided to try making some naan using Aayi's Recipe. 1. Heat the water to about 110 degrees. Add yeast, sugar and salt. Leave it for 10mins till the yeast forms a froth(gets activated). 2. Add all remaining ingredients and make it into a dough. Knead for 3-4mins. 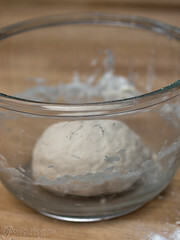 Cover with a cloth or plastic wrap and leave it in a warm place for about 2-3hrs till the dough doubles in volume. 3. Preheat the oven to 425F. 4. 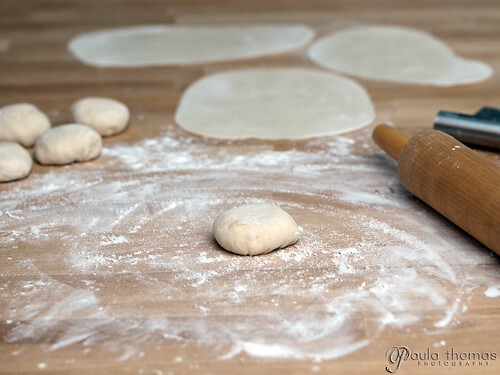 Make balls from the dough and roll them. Do not make them too thick as they puff up when baked. Apply a little butter on top. Line them on a lightly buttered cookie sheet. 5. Bake in the oven at 425F for about 7 mins till they puff up. 6. Take out, apply the garlic-butter mixture on the top and keep it in the oven again. Bake for another 5 mins till the top looks brownish. I followed the recipe and didn't really make any modifications. I may have rolled the dough out a little too thin or cooked the naan too long cuz it came out pretty crispy. Crispier than the naan I've had before. I also sprinkled some chopped basil on top after it was done cooking. It didn't taste quite like traditional naan but it wasn't bad. I ate 3 of them fresh out of the oven. It's the best time to eat them!